There’s a 50/50 chance that a massive solar storm will hit the earth and destroy most/all our electrical and electronic equipment some time in the next 42 years. Are you prepared for this? We’ve written many times before about the vulnerability posed to much/most of our electrical and electronic gear by a major solar storm. Indeed, noting the expert opinion that suggests there’s a 12% chance of this type of disruptive solar storm destroying most of our modern life and lifestyle within the next decade, a solar storm and its effects should be considered one of the greatest risks of all to prepare for. There are two issues to consider when thinking about solar storms. The first is how strong it will be. The second is whether it will reach the earth or not. That second point is a bit of a saving grace, because solar storms don’t radiate out equally in all directions from the sun simultaneously. They flow in a specific direction, and if the earth isn’t in the path of that flow, it has no impact on us. Here’s a fascinating story of two solar storms that erupted in close succession a couple of years ago (why are we only finding out about this now?) and which had the potential to “disable everything that plugs into a wall socket”. Fortunately, the direction those two solar storms traveled did not take them past where the earth was at that time. But imagine if they had come directly to us. How would your life change if everything plugged into a wall socket was disabled? Remember, it isn’t just everything plugged into your wall sockets, but everything plugged into everyone’s wall sockets that would be disabled. Oh yes, to say nothing of the electrical grid and the transformers and switching circuitry that routes the electricity around the country. The article points out one impact – you’d no longer be able to flush your toilet, due to the city water supplies suffering from electric pump failures. But not flushing your toilet (oh yes, the sewage lines would back up too, because the sewage pumps would also fail) would surely be the least of your worries. How about also no fresh water to drink or cook with? No heat (or cooling) and light for your home. No food in the stores. No internet or phones. Pretty much no anything at all, and potentially for somewhere between weeks, months and years (the super-transformers in particular would take many years to replace). The good news is that a solar storm would not destroy our retreat or current dwelling structure, and would not instantly emperil ourselves. If we were quick, we would have time to respond to the event before the general population as a whole realized what had happened and started to panic. A response (and panic) might actually take longer to occur than you think. If all radio, television, phone and internet services are down, it would take some time before what people would instinctively assume merely to be a pesky short-term power cut became to be appreciated as a more severe, more global, and longer-term event. Even as that awareness slowly developed, there would still be a huge passive expectation that ‘the government will help us’ – although of course, the flipside of that expectation is very ugly. As people realize the government isn’t going to help them and can’t help them, that encourages a feeling of outrage and betrayal and a perception that all normal rules and constraints have been abandoned. That’s the point when people start rioting, looting, setting fire to things, and becoming mindlessly violent at anyone who they feel deserves to be the focal point of their anger – in particular, anyone they see as being more fortunate than themselves. It would definitely be a good time to be getting out of Dodge! 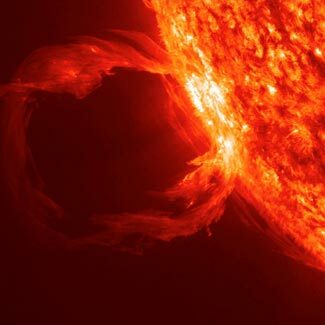 Massive solar storms that could destroy everything plugged into a socket have occurred before (the Carrington event in 1859, and probably more in the past that didn’t matter so much when we had nothing electrical or electronic to be affected by them). Not quite so severe solar storms have occurred more recently (Quebec in 1989). It is more a case of when rather than if another solar storm will hit the earth with severe – unimaginable – consequences. Statistics say there is 12% chance of this happening in the next ten years, which means it is almost sure to happen every 83 years, and there’s a 50/50 chance every 42 years. Solar storms are survivable because they don’t destroy structures or injure people. But they require you to be well prepared and able to become fully self-sufficient for probably a decade or more. One last comment. Our sense is the authorities underplay this risk. We feel they prefer to under-rate the chances of this happening, and to under-rate the impact if it does happen. Even in this most recent article, the example of the disaster that would follow is limited to ‘your toilet won’t flush’! But think about that – if your toilet won’t flush, you’re in a dozen other worlds of hurt that are much more life threatening, at the same time. The authorities prefer to downplay this rather than alarm the masses and expose their own inability to protect us the way so many people expect, demand, and assume.